Every day when I come back from work I make dinner for my family. During a working week this is the only time when we sit together for a meal. This was a busy week with a lot of after work/school commitments, some take outs and dinners out of the home. Today I didn’t have enough time to cook something big, so I decided to make this delicious cheesy pepper bread paired up with some fresh mozzarella cheese, Bosnian smoked sausage (sudžuk) and campari tomatoes. 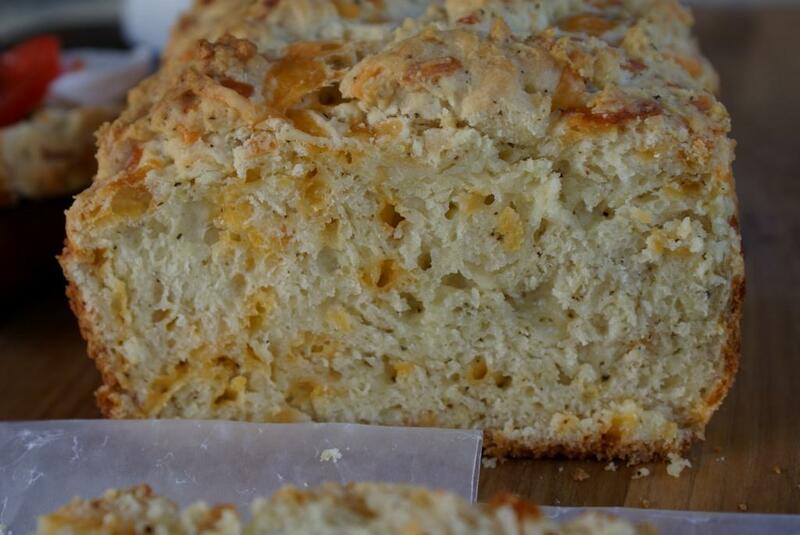 The recipe for the Cheese Pepper Bread comes from an old country cookbook I bought a few years ago at a yard sale. It was well worth the 50 cents I spent for it. 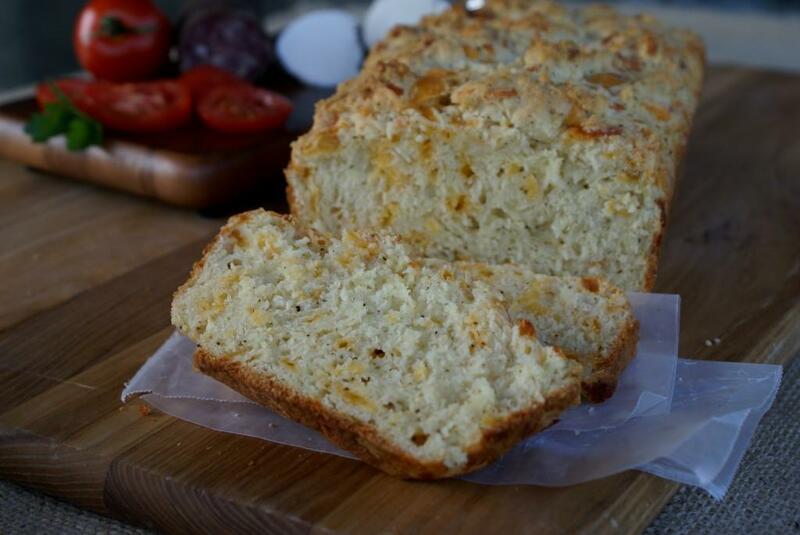 This bread is simple to make, it is done in less than an hour and tastes wonderfully cheesy and piquant. Preheat oven to 375 F (190 C). 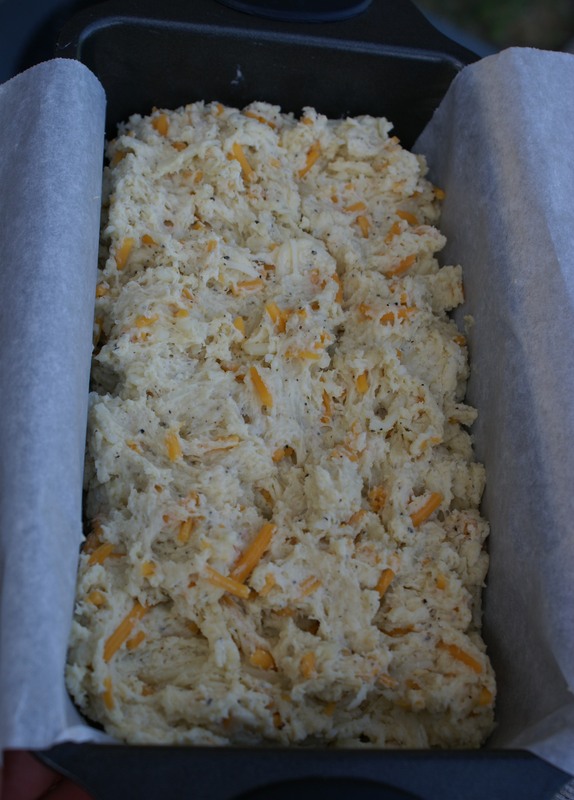 Line your 9x5x3 inches (23x13x7 cm) loaf pan with parchment paper. Melt butter over low heat and set aside to cool. 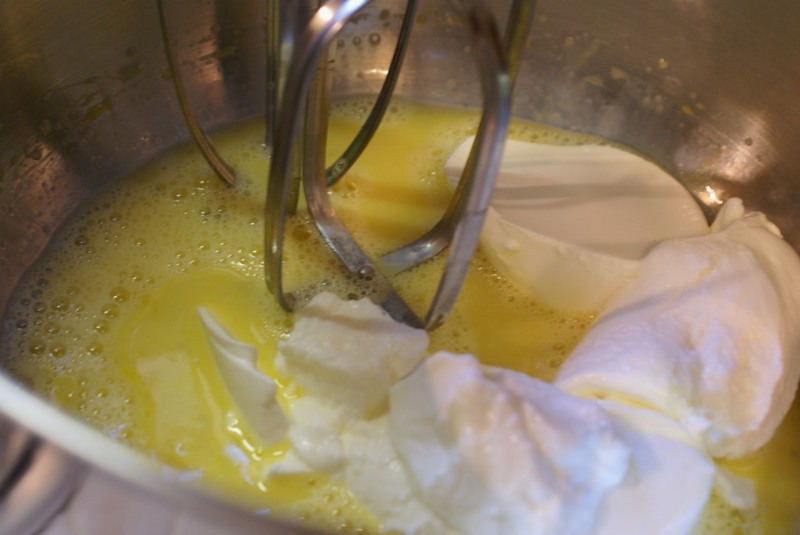 In a medium bowl lightly beat eggs, add yogurt and melted butter. 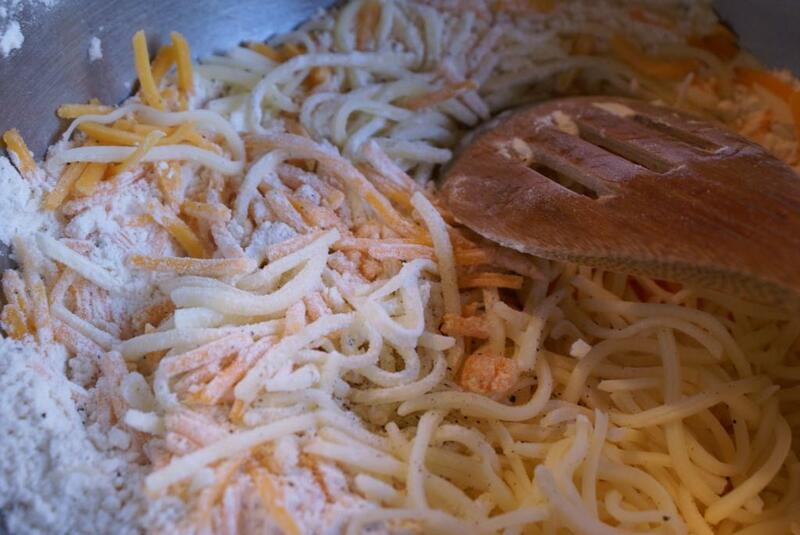 Pour this mixture into flour just until moistened. Spoon into prepared loaf pan..
Bake about 35 minutes until golden brown or until tooth pick inserted in center comes out clean. Cool in pan about 10 minutes, remove from pan and serve. I love cooking breads. This one looks very good!!! Thank you Donna! 🙂 I love ’em too and this one is on the top of my list – so yummy! Sibella, I like the surprise elements–lots of freshly ground pepper and plain yogurt. 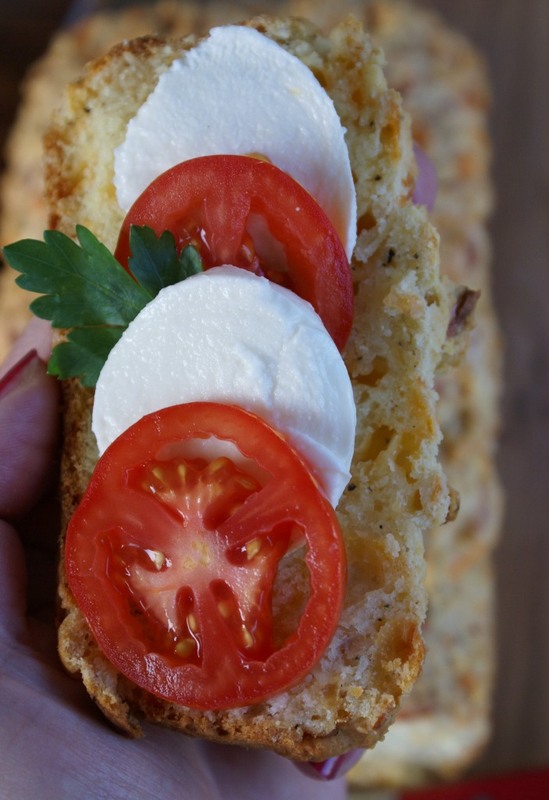 I love home made bread and what a gorgeous shot with the bread, cheese, and tomatoes! Bravo! Thank you April! 🙂 Have a wonderful Memorial Day weekend! I see the pepper here is black pepper (which I love), not bell pepper (which I hate!) Phew. Looks delicious! Thanks Sara! Yes – black pepper! Even though I like bell pepper, I don’t think I would put it in bread. 😉 This bread would also go well with some pate or creme fraiche (which I am getting on my way home from work)! Wow, does that look good. We have a similar bread in the US Southwest which uses Hatch (New Mexico) green chile made as spicy as you like. Definitely will try your recipe. 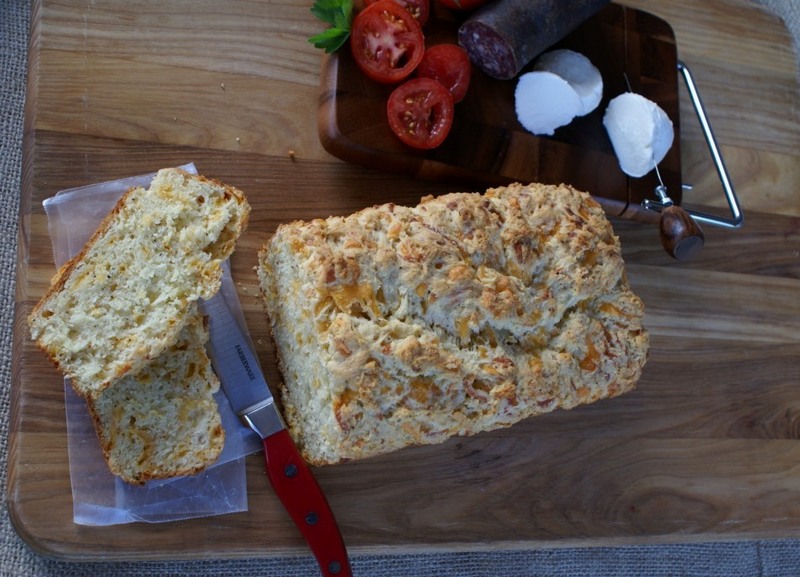 Sibella, this sounds like the perfect bread to make over a weekend when you want a light dinner of snack. A slice of bread, some cheese and pate sounds nice. Thanks Deb! 🙂 Have a wonderful week! It looks lovely… the recipe looks like an English scone dough, is it similar? Those sort of books are best, aren’t they?